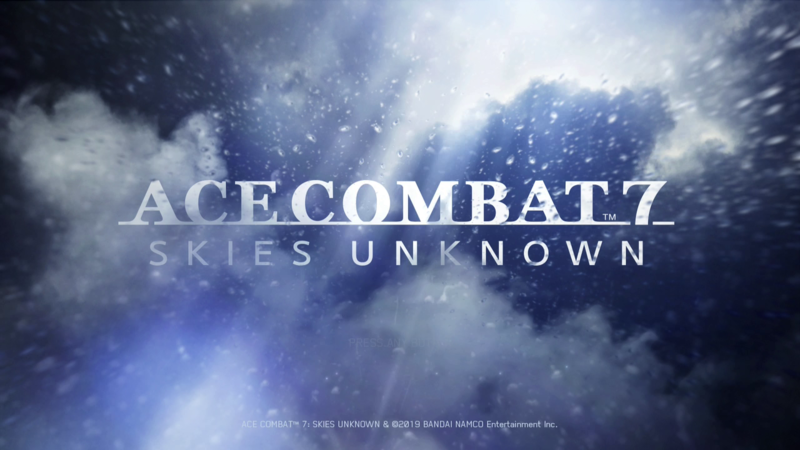 Ace Combat 7: Skies Unknown is a welcome return to the world of Strangereal last seen in Ace Combat 6: Fire of Liberation in 2007. This entry contains the hallmarks of Ace Combat: radio chatter during missions that inform the player on the emotional state and motivations of allies and enemies alike, fantastical superweapons, a silent protagonist, two-phase briefings, a post-mission replay with switching camera angles, and cutscenes telling a story that is (mostly) separate from the player character’s. 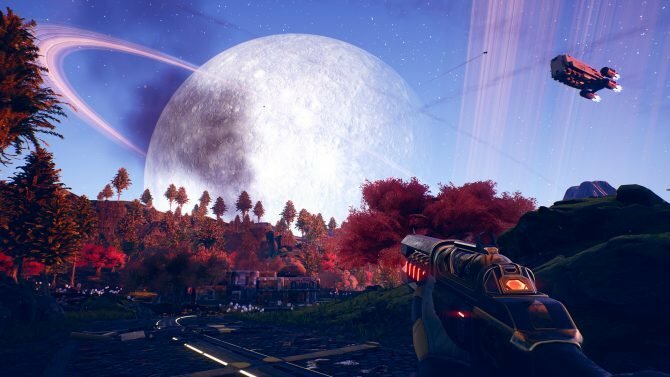 All of these familiar elements have been updated with 2019 visuals that match expectations for the current generation. 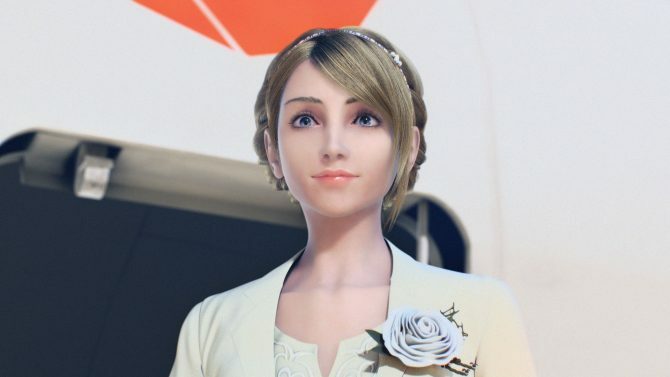 Despite the update, Ace Combat 7 still exists in the shadows of earlier entries. Specifically in regards to the fourth, Shattered Skies, one that I hold with high fondness and the other to take place in Usea. Multiple characters without a clear focus weaken the overall narrative, and the game seemingly wants to broach the subjects of civilian casualties, the impossibility of a clean war, and especially the introduction of drones to war, but never spends much time on them. Skies Unknown is a very nice reintroduction to Strangereal, complete with references to the history of the world players of previous games will recognize, but can’t seem to reach the same highs. It is very hard to not compare Skies Unknown to Shattered Skies, as it is the Ace Combat game I played through again a year ago and because Skies Unknown takes place throughout the Usean continent. Erusea is once again going to war, this time against the federation of Osea. Key locations from Shattered Skies exist within missions in Skies Unknown, one of which is a great fanservice moment. This comparison doesn’t work well for Skies Unknown though, as Shattered Skies focused on the dual narrative between Mobius 1, the player character, and Yellow 13, the enemy ace. Though, as I noted in my retrospective video, it’s more about Yellow 13 than anyone. Due to this, the narrative could focus on a very small group of characters during its brief four-hour runtime. Skies Unknown includes at the very least four major characters that we follow during its runtime of about 11 hours. Some get by, such as Avril Mead, the main voice of the narrative, and others are pretty weak. Dr. Schroeder never really justifies his existence other than to explain how the drones work, and Mihaly, the enemy ace, doesn’t earn much sympathy despite his frail state. Princess Cossette, the most interesting character due to her active status as a mouth for Erusea early in the war and who is forced to confront the consequences of her actions, doesn’t get enough time onscreen. 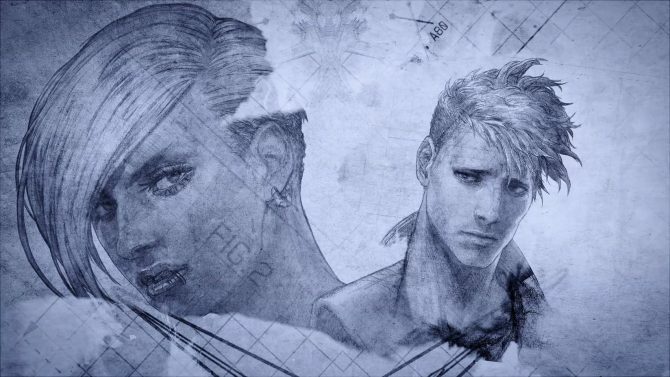 Instead of focusing on Avril and her latent daddy issues I wish we had instead focused a bit more on Cossette’s eventual turn against the war her kingdom started, as well as delving deeper into the various nations absorbed by said kingdom and their erasure from the culture that is hinted at in a cutscene about Mihaly. There are some really interesting themes being mentioned throughout Skies Unknown, but the game barely ever engages with it in a meaningful way, which is disappointing given Project Aces’ ability to make me empathize and feel bad for an enemy ace who was only ever described to me secondhand. At the very opening of the game drones are mentioned as a threatening presence to pilots, both due to Avril addressing them antagonistically and by the AWACS of the first mission asking if any of the enemy jets were drones. Drones in this war are being used by Erusea to boost their war efforts and are supplied with data by an ace pilot named Mihaly Shilage. Creator of the drones and data collector is Dr. Schroeder. The greater enemy is generally nameless, as both Mihaly and Schroeder aren’t overtly antagonistic or evil. The former is merely at home in the sky and finds use by pushing his aging body to its limits. 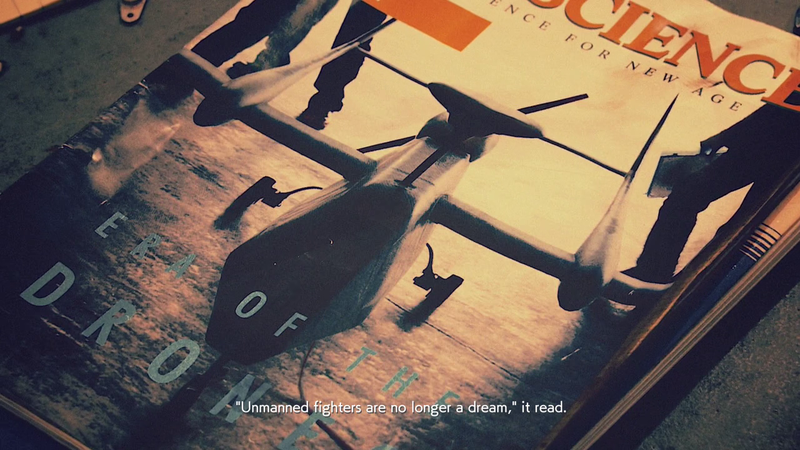 The latter is more interested in advancing drones, until a change of heart later on. Drones are mostly just a threat to kicking pilots out of the air, and their ability to make war more palatable since they do not endanger pilot’s lives are merely radio chatter during a late-game mission. Drone warfare, in reality, has been the cause of lots of civilian deaths and terror, and the game does address that as well, sort of. The desire for a “clean war,” one without or minimal civilian casualties is brought up a few times in the background. 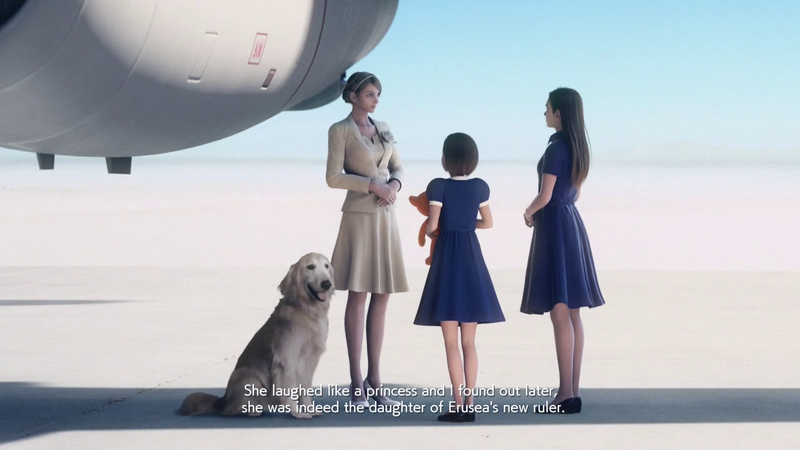 A news report emphasizes how Osean fighters shot planes down over residential areas (a similar situation jump starts the narrative of Shattered Skies) and the realization that a clean war is impossible later on helps turn Erusea against itself as well as motivate Princess Cossette to attempt to atone for her activities as propaganda for Erusea. As a silent protagonist you once again slowly work your way into becoming the beacon of hope for the end of the current conflict, which has always been a satisfying curve to follow. This time there is an interruption early on, where your ascension is thrown for a loop due to a tragedy you get blamed for. The shift in relationship between you and command in briefings and during missions is a good change since it upends the traditional arc for a little while and leads to a good dynamic between the copilot Count and others in a later squad who aren’t aware of your backgrounds. This antagonistic situation also leads to one of the more shocking deaths in the game. Otherwise, the player character isn’t much of a character and instead simply the player whose only interaction with the world is to blow up AA guns and SAMs. 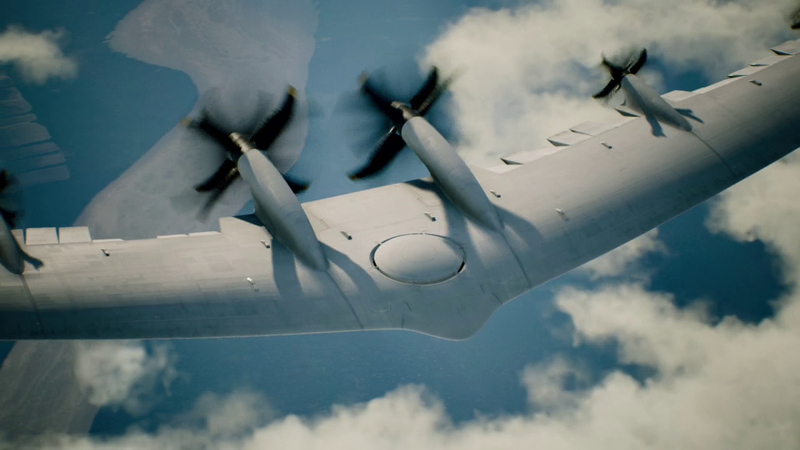 This I am totally fine with as Ace Combat 7 introduces enough variations on the general air combat formula to keep things interesting throughout. Certain special parameters sometimes interject at the beginning or middle of a fairly standard air-to-ground, air-to-air, or mixing of the two, missions. Some of these work well with the basic gameplay, such as a mission requiring you to stay in or below cloud cover in order to avoid being shot down by a satellite tracker, a special weapon that allows you to guide the payloads of large bombers towards disguised ICBM silos, and missions that require you to identify unknown units before firing on them. Others are just frustrating. One mission has you tracking fuel tankers in a sandstorm that causes them to blip on and off of the radar. This would be fine if you didn’t have to contend with the time limit and deal with the constant threat of drone missile attacks while you try to cover a large swath of the map while nearly blind. 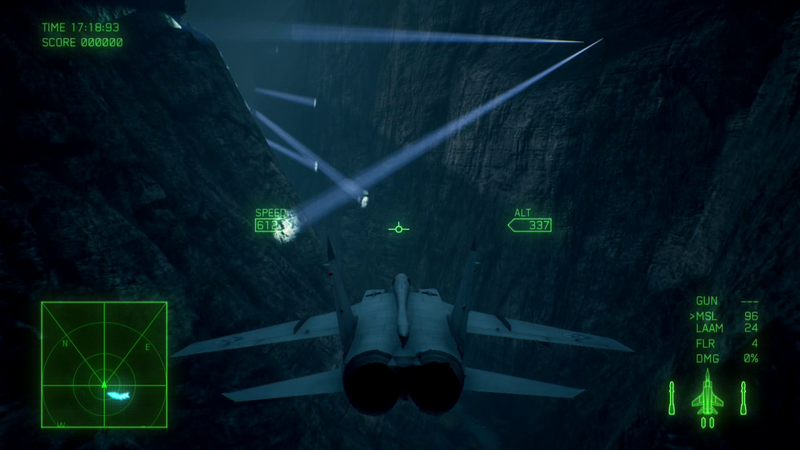 Even worse, a later mission forces you to stay below a certain altitude while flying through a canyon and throws in waves of searchlights to avoid while you do so. Another (frustrating) Ace Combat staple, point-raking missions that 15 minutes long and contain no checkpoints, also make a return in Skies Unknown. Superweapons are here, including a super-structure: the space elevator, which is a point of contention and icon for the entirety of the game. Alongside the space elevator is the Arsenal Bird, a huge aircraft that can release way too many UAV drones to threaten you with missiles constantly. Even without drones on the field in mass quantities, pretty much any presence of SAM units or aircraft in the vicinity means you can never fly too long before the dreaded red UI and constant whining of a missile warning go off. I can appreciate the aggressiveness of enemy units, but at some points, it was just too much. Whenever Mihaly or a unique drone appeared also meant the appearance of difficulty spikes where it seemed like we were locked in never-ending circular motions without ever being able to land a hit. This is repeated in multiplayer dogfights so I suppose they succeeded at modeling the AI after humans, but it doesn’t make for very fun segments. Instead, the only seemingly consistent way I could do damage was to bait the enemy into a chicken face-off where we would both head towards each other at top speed, unleashing missiles and machine gun fire. Despite the spikes in difficulty, it gets easier towards the end as you unlock more in the aircraft tree. This branching collection of aircraft, weaponry, and parts is where you spend points earned during the campaign missions and carry over into multiplayer as well. 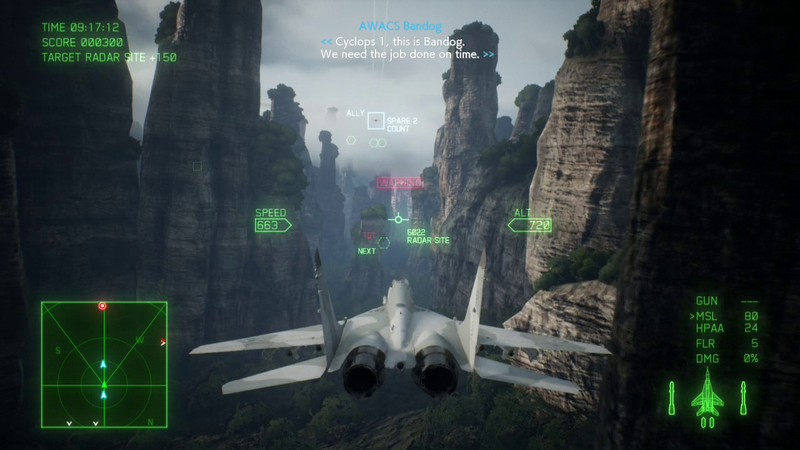 While everything goes as far as what you can use in the campaign, multiplayer will have restrictions based on the host who can determine whether a certain point ceiling is instated to keep people from using the F-22 Raptor on players just starting out. Parts are perhaps the best feature of this tree, as each have their own separate branch, resource value, and ceiling so that often you’ll be having to choose if you want more missiles or more powerful missiles for a mission. It’s a small but nice way to customize each plane for whatever the mission requires. 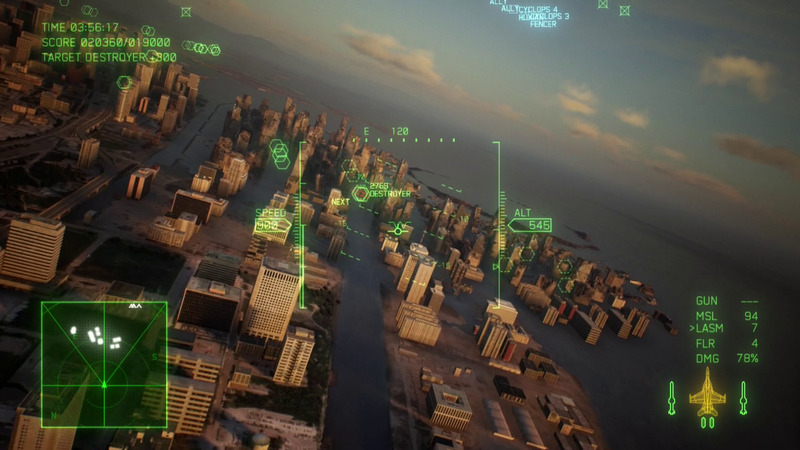 Some other changes include cloud cover can be used to throw off missile lock-ons, both for the enemy and yourself, lighting strikes threaten your HUD, air currents throw you off center, area of effect attacks can occur and radar centers force you to fly through invisible corridors. Flying into and out of clouds never got old due to its effect on your view and the muffling of whatever music and sounds are performing at the time. Some of the music tracks seemed to contain familiar themes, the strongest was during the attack on Farbanti which makes sense given it’s the same city, just fifteen years later or so and some things have changed. Whether the tracks in Skies Unknown will join the ranks of other scores will be a test of time, but unfortunately, none of the tracks stuck out like the introduction of Megalith. It can be hard, due to how every game with big money behind it looks good, to emphasize that this game looks really good, but believe me Ace Combat 7 looks really good. Generally, weak land textures have been much improved, such as not only buildings but forested areas obscuring targets, and give greater detail to the landscape than ever before. The map that features multiple columns of landmasses just begging you to fly between them on your side is definitely a standout not only for the unique visuals of the land but also for the lighting storm that swallows it up. 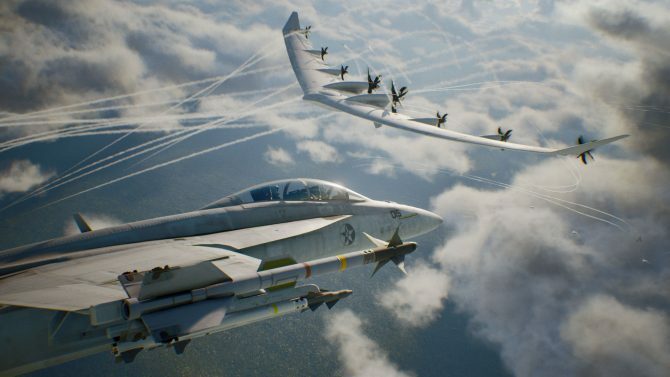 Though I was disappointed in some aspects of Ace Combat 7: Skies Unknown I still think it’s a good return for Project Aces to the Strangereal universe they created so long ago. It continues the series’ theme of being anti-war, about fighter pilots who enjoy being in the sky more than shooting down enemy jets, and avoids creating an enemy who are easy to hate and instead are much more grey. I do wish it made more than passing statements about a few topics and had also focused on a smaller cast, specifically the princess who seems to have the only arc in the game that could match the player’s ascension to breathless reverence among the coalition. Certain characters did end up endearing themselves to me, as their deaths did leave a certain absence or guilt over not appreciating their presence, so the game does succeed in evoking emotions not many others do. 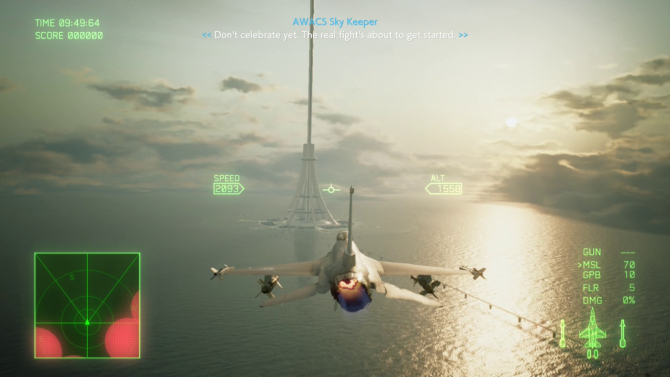 Ace Combat 7: Skies Unknown reaffirms I am way too invested in this Strangereal universe and that arcade flight sims are capable of telling compelling stories about war.